Greetland v Midgley. Aaron Dorward for Greetland and Dan Vile for Midgley (in yellow). Midgley United went clear again at the top of the Haslem-Sheppard Halifax AFL with a 3-1 win at Greetland in the battle of the leading pair. Goals from Kurtis Elder, Sam Tattersall and Ted Vile gave them victory in a scrappy game played in typically blustery conditions at exposed Goldfields. Good work from George Bamford paved the way for Elder to go through in space and open the scoring on 15 minutes. Bamford suffered a dislocated shoulder shortly after but that didn’t stop Midgley going 3-0 up, helped by strong performances from Andrew Butterworth and Rob Stansfield, who were deputising for Joe Gibson and Euan Davis in the centre of defence. Greetland eventually got one back but had Matty Oldfield dismissed late on. The win took Midgley seven points clear but three teams have six games in hand and can overhaul them. 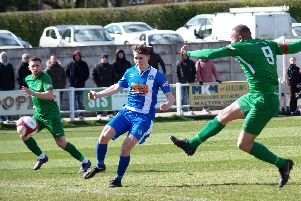 Sowerby Bridge are one of the trio and they went third with a hard-fought 5-1 win away to a strong Denholme United side in the only other Premier Division game to go ahead. Denholme might have opened the scoring on 15 minutes but Jordan Bolton made a fine save from Michael Midgley. In challenging conditions, Bridge played some stunning football and three goals in a four-minute spell put them firmly on course for victory. Sam Hiley fed Damo Watkins in the box and the striker laid it off for the impressive Jordan Bedford to slot home. Bedford and Lee Wood then combined to set up Watkins for a good finish and Bridge’s golden spell continued when Sam and Tom Hiley worked the ball to Adam Barlow, who drilled a left foot shot into the bottom corner. In the second half, Sam Hiley was brought down in the box and Barlow made it 4-0. Denholme were also awarded a penalty but the unfortunate Ross Parr slipped and although the ball went into the net he was adjudged to have kicked the ball twice. Denholme did pull one back shortly after, when substitute Byron Coyle bundled the ball home at the second attempt following another good save by Bolton. Bolton made a super one-handed save before Barlow scored again from the spot to complete his hat-trick. The Shelf FC versus Sowerby United match at Westwood Park was one of four matches in the league called off.